Basement bathroom installation is a simple process and it does not require the owner to install a new plumbing system for the basement. The owner is saved from the trouble of spending a large sum of money as the plumbing system of the bathroom in the basement can be connected to the plumbing system of the rest of the house. The location of the basement bathroom is one of the factors that must be considered before taking any practical step. It is recommended that the new bathroom should be right under an existing bathroom so that it may be near the sewer lines. For basement bathroom installation, you would require chalk, tape measure, plumbing tools, drywall, framing members, pipes, bathroom fixtures and finishing materials. You must plan the entire project before you actually begin working on basement bathroom installation. 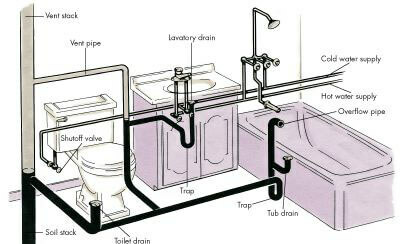 It is recommended to keep the map of the plumbing system of your house. Decide where the bathroom should be located, preferably under another bathroom upstairs, as it would reduce installation cost. You must chalk out the available space of the bathroom first so that all the fixtures can be purchased according to the size of the area. The size of the plumbing fixtures should be in relation to the space you have specified for the bathroom. The walls of the bathroom must be built out of wood and drywall. It is recommended that moisture-proof drywall should be used as the basements are usually moist and damp. You must use a sewage ejector system in case your bathroom is below the level of the sewage pipes as is the case in most households. This system would help to get the water waste out of the basement bathroom. Once the sewage ejector system is installed, you can proceed to install all the plumbing fixtures in the basement bathroom. It is recommended that a Dr.Pipe plumber should be called to take a final look at your bathroom before you start using it. We would be able to make all the final connections and fix anything that you might have missed. It is more affordable to call the plumber for the final job only rather than for fixing the entire bathroom. Once the basement bathroom installation is complete, you can add finishing touches to your new bathroom. Tiles can be fixed on the floor and walls can be painted according to your choice. Put towels and any other final changes according to your taste. Basement bathroom Installation would increase the value of your property but you must have the basic knowledge of how the plumbing system works before you start making any major changes. It is better to call Dr.Pipe plumber if you doubt that you will be able to do it yourself. You might end up breaking something while trying to fix up your new bathroom.